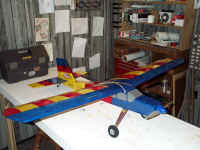 Paul's Planes SIG LT-25 page! My LT-25 is finally done. It's powered with an AF15G 2.38/1 on a 11 cell RC2400 battery and a Pegasus 35 ESC. 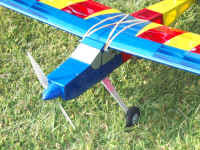 I have an APC 12x8E prop mounted for the first flights, and I'm sure this prop will work fine because I have seen this combination many times on-line and this is the most popular prop by far. The finished weight is 83 oz. 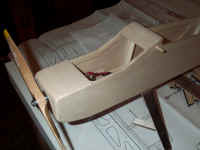 This was a very easy plane to build that went together very quickly. It would have gone even faster, but I sanded off all of the laser cutting burn on the edges because I planned on using transparent Monokote. 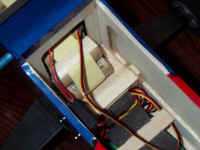 I modified the nose to enclose the electric motor a little better, and enlarged the hatch for easier battery access. 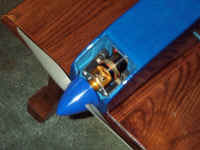 For the tail wheel I used pull-pull cables. I tried Spiderwire for these and it looks like it will work well, but time will tell if the fishing line will last or not. Click on any picture to see it full size.